Soil City was initiated by Open Jar Collective to create space for conversation, participatory research and knowledge exchange about soil. Soil isn’t part of most everyday interactions, education or policies so we created a project that was designed to give people the permission to play, touch, and examine their relationship to soils. 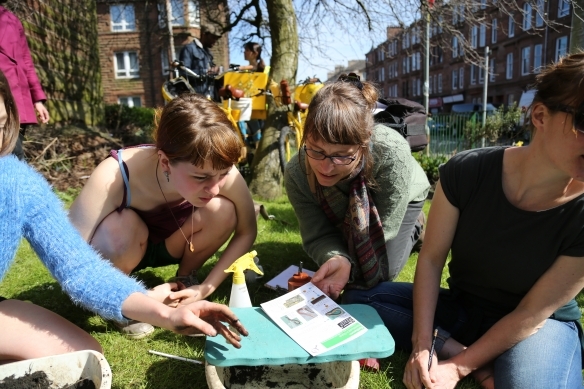 It was launched at the Glasgow International Festival of Visual Art in April 2016 and we kicked off the project by hosting a two week Soil City Lab with a programme of on site and off site activities. It was documented and shared on the Soil City website in the form of field research – images, films, reporting. Since then we have continued our investigations in different ways, with different groups of people and in different cities. 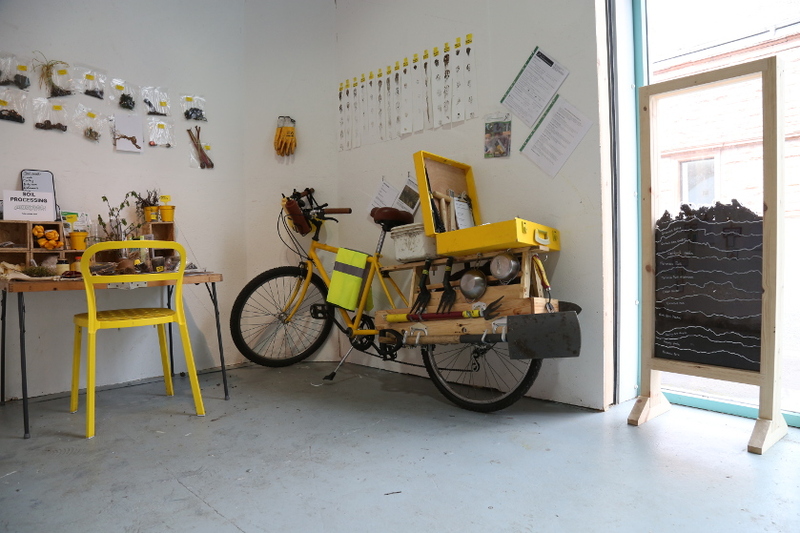 The work of Open Jar Collective always has food at it’s heart, whether it is as a tool for social interaction, a means of exploring our environment or directly trying to question and change the food system. As we make projects about the production and consumption of food we naturally started to think about the broader ecology of our food system, and soil as a fundamental part of that. We found soil as a subject touched on a number of our interests including fermentation, community regeneration, cultural memory and the common good. We decided to use the framework of a city because although soil doesn’t recognise the boundaries of our city there is a different cultural relationship between people and soil in the city. What we found interesting about that from a rural communities perspective is that there is hardly have any public land and actually in the city we’ve got loads more public land. Looking at soil and the city in relation to the term land brought up more questions around common good and land ownership and what land is used for. In Glasgow in recent years we’ve seen so much transformation happen, constant regeneration and renewal. Soil isn’t necessarily talked about as part of that. We wanted to explore those questions as well as the physicality of the soil. We found that loads of the soil in the city used for landscaping and creating gardens is brought in from somewhere else and we often don’t know where that somewhere is. We began to think of this like a covering over of the past, as if we can’t deal with the history, so we seal it and then bring in someone else’s soil to make this place. Soil is a site of memory for the city and it tells us historically what has happened and it reflects the traumatic ways in which the land has been treated. As artists we are interested in people’s relationships to their environment and empowering them to make changes. 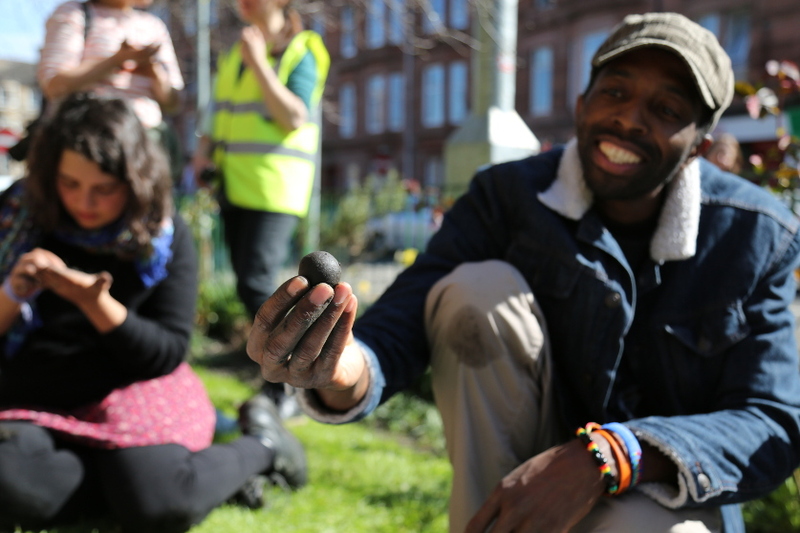 We feel that doing hands-on work with people – which is about taking them on journeys rather than just showing or telling things – can be a powerful tool for people to learn and gain new perspectives on something like soil. We think socially-engaged arts practices are often about inviting people to enter into a dialogue on their own terms. We wanted to see if we could provide alternative narratives to the idea, which lots of people believe, that there is nothing we can do about contaminated soil. Artistic practice and ecology share the process of close observation, often seeking to create new connections between the natural and the built environment. Artists take this one step further by giving an equal amount of curiosity to other factors, from intangible heritage to social value. Artists may collect personal stories and explore shared memory as a means to build not only a more holistic knowledge of ecology, but to deepen the emotional connection between people and place. It is this informed and personal relationship to nature which often provides the imperative for sustainable stewardship. An artistic approach to generating multiple layers of narrative can have an even stronger place in collaboration with scientists and the empirical data they gather. As well as encouraging interaction with soil we wanted to stimulate people to ask questions which relate to the longer-term aims of the project: what changes would you like to see? ; What is it that matters to us about the soil? ; How could we change the things that we find problematic? As a starting point though, we realised that a lot of people didn’t know anything about soil at all and that maybe we had to start the conversation from just looking at it, going outside, getting our hands dirty. We are currently looking ahead to the World Congress of Soil Science which will be held in Glasgow in 2022 and how we can share our research with an international audience. We have produced two Soil City publications which are available on ISSUU and hope to keep this space we have created open for further conversation and action. What Constitutes a Place? What Makes a Region Integrated? Using the case of the dispersed Municipality of Brøndby in Greater Copenhagen, this article focuses on how built-in borders in a given area can be overcome in order to create everyday integration and thus put forward a positive urban development. The integration project of the Danish-Swedish borderland into the Oresund region is a multifaceted process where practices and perceptions of space and time unfold simultaneously.